2010 Update to Preferred Stock Investing! Get the 2010 update to Preferred Stock Investing! Preferred stock investors want the highest rated, highest quality issues that are offered by companies with a solid track record and generate the highest dividends. As itemized in Table 1, there are currently seven preferred stocks that (1) are generating a current annual yield of at least 7%, (2) have investment grade ratings, (3) are offered by companies that have a perfect track record of never having suspended a preferred stock dividend, (4) have the 'cumulative' dividend provision (if the issuing company skips a dividend to you they still owe you the money) and (5) are available right now for a market price less than $25 per share (their 'par value'). These are common objectives for risk-adverse preferred stock investors looking for a respectable return with acceptable risk. Unfortunately, preferred stock information is scattered all over the Internet forcing preferred stock investors to spend more time searching for data than using it. There are lists of preferred stocks, but what good is a list without knowing how to invest in them? Some lists include descriptive information but lack current market pricing; ex-dividend dates are often missing or incorrect and current ratings from Moody's and S&P are hard to come by. Brokerage systems list market data (price, volume, ex-dividend dates) but not ratings or the company's preferred stock dividend track record. What has been lacking is a single place where preferred stock data is consolidated and then combined with a structured preferred stock investing method backed by many years of solid preferred stock market research. During January we introduced a new software application to the CDx3 Notification Service (my preferred stock email alert and research newsletter service) called Preferred Stock ListTM (see: Step-By-Step Example | User Guide). Preferred Stock ListTM extends the coverage of the CDx3 Notification Service to all U.S.-traded preferred stocks. Preferred Stock ListTM is a preferred stock data gathering engine and is the only tool available that can filter through all preferred stocks trading on U.S. stock exchanges and produce the short-list seen in Table 1. Preferred Stock ListTM generated Table 1 in just seconds (and without having to install any software on your computer). The current short-list seen in Table 1 is interesting for several reasons. These seven high quality preferred stocks are offered by six different companies, only two of which are banks. For those looking to spread investment risk across industries, this short-list demonstrates how Preferred Stock ListTM can help preferred stock investors diversify their preferred stock portfolio beyond financials. And each of these six companies has a perfect track of never having suspended a preferred stock dividend. Take a look at the ex-dividend date column. 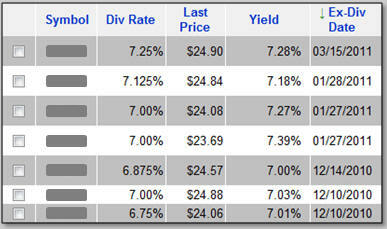 This is the most recently declared ex-dividend date for these seven high quality preferred stocks. These all pay quarterly dividends so six of these seven paid their most recent dividend in December and January (we won't see these dates change for these issues until their issuing companies declare the next round of dividends in March and April, respectively). Now look at the top row. The ex-dividend date for this issue is coming up on March 15. Whomever owns shares of this preferred stock when the market opens on March 15 will be entitled to receive this quarter's dividend payment. All such dividend payments are for the full 90 day quarter regardless of when during the quarter you purchased your shares. With preferred stocks, even though you only own the shares for part of the quarter, you will receive the entire quarter's worth of dividend cash from the issuing company. The preferred stock on the first row of Table 1 is issued by a $3.5 billion company founded in 1972. With a 7.25% dividend rate, shareholders of this preferred stock receive $0.45 per share of dividend cash every quarter [($25 x 7.25%) divided by 4 quarters]. Preferred Stock ListTM combines the preferred stock investing method described throughout my book, Preferred Stock Investing, with powerful data gathering and filtering features not provided by any other website or software tool. Preferred Stock ListTM was added to the CDx3 Notification Service website (take tour) in January and is now available to all subscribers. (Already a subscriber? For symbols, launch Preferred Stock ListTM from the subscriber's website Dashboard then follow the Step-By-Step Example). This month there are 15 preferred stocks offered by our Big Banks that provide a potential layer of principal protection not available with many other preferred stock issues. This table presents an updated list of Big Bank-issued trust preferred stocks (TRUPS) that will be among the first affected by section 171 of the Wall Street Reform and Consumer Protection Act, signed into law on Wednesday, July 21, 2010. Effective January 1, 2013, the new law prohibits Big Banks (assets greater than $15 billion) from counting their TRUPS in their "Tier 1 Capital" calculation, a measure regulators watch when assessing the adequacy of a bank's reserves. These Big Banks are therefore likely to retire ("call") their TRUPS. Investors who hold shares of a TRUPS when it is called will receive $25.00 per share, so investors who purchase shares now for less than $25 position themselves for a capital gain on top of the above-average dividend income that they will be earning in the meantime. Buying your shares for less than $25 provides a layer of protection for your principal. (Already a subscriber? For symbols, check out the current issue of the subscriber's newsletter, CDx3 Research Notes). Duke Realty has historically been a real estate company focused on suburban office space. But by late-2009 Duke saw its occupancy rate drop from north of 90% to a ten-year low of 87.4%, its tenants being battered by the credit crisis and recession. In September 2009 Duke announced that by 2013 it would reposition its property portfolio to emphasize industrial and healthcare properties and move away from suburban offices. Specifically, Duke was going to dramatically shrink its office space holdings from 57% of its portfolio to something less than 40%. Industrial holdings would increase from 37% to 60+% and healthcare properties would almost triple from 6% to something in excess of 15% of Duke's portfolio. This is not a small portfolio we're talking about. Duke owns and operates 134 million square feet of leasable space in 18 major U.S. cities. Making these types of changes are a bit like turning an aircraft carrier. But by the end of December 2010 Duke had completed transactions worth $967 million toward its repositioning objectives including the sale of 20 office buildings (3.1 million square feet) valued at $517 million. This sale generated net proceeds of $414 million for Duke. Almost simultaneously, Duke also acquired 51 industrial properties in Florida (4.9 million square feet). These transactions effectively allowed Duke to trade in 3.1 million square feet of properties with low occupancies for 4.9 million square feet of space with higher occupancies. 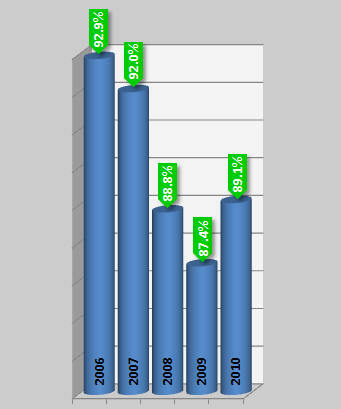 This table illustrates Duke's progress and the results thus far. You can see the declining slope that Duke was facing once the real estate bubble burst in 2006. Occupancy, driven largely by its suburban office holdings, was in a free fall. But after repositioning its portfolio in 2010 the early results are encouraging, with overall occupancy increasing to 89.1%. The financial results are encouraging as well. On January 26, 2011 Duke announced fourth quarter 2010 results of $0.28 in funds from operations, exceeding Wall Street expectations. Learn more about Duke Realty: Company website | Profile | Upgrades/Downgrades | Recent News. What price is used to calculate preferred stock dividends? Most preferred stocks offer a fixed dividend return as published in the prospectus. The long-term average annual declared dividend rate (called the "coupon rate" in reference to days gone by when investors had to tear off a coupon and present it in order to receive their dividend cash) for the highest quality preferred stocks is about 7%. While there are a few exceptions, preferred stocks generally pay these dividends to shareholders each quarter. As the end of the quarter approaches, the company's board of directors meets and declares the key date that you must be a shareholder of record in order to receive the upcoming dividend cash. This date is referred to as the record date and is set by the issuing company. The day that the company declares the record date is called the declaration date. But in order to allow for processing time, the stock exchange where the preferred stock trades needs a couple of days prior to the record date and will set their own cutoff date. This date, set by the stock exchange, is called the ex-dividend date. Whomever owns the shares when the market opens on the ex-dividend date will receive the upcoming dividend payment. So the important dates each quarter, in order of occurrence, are the declaration date, the ex-dividend date and the record date. These are the key dates for determining who is going to receive the upcoming dividend. But since market prices fluctuate every day, the share price of a preferred stock will almost certainly be different on each of these dates and will also almost certainly be different from your original purchase price. So when we say that a preferred stock pays a 7% annual dividend, to what are we referring? 7% of what? 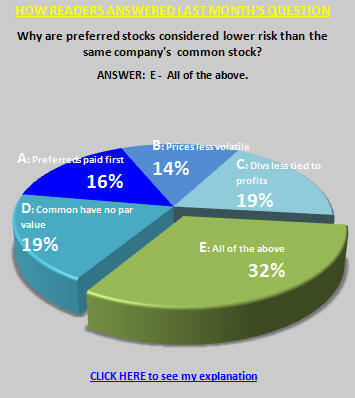 The question this month for preferred stock investors: What price is used to calculate preferred stock dividends? The correct answer to this question is (C), the liquidation price. The declaration date (date that the issuing company declares the record date), ex-dividend date (set by the stock exchange) and record date (set by the issuing company) occur prior to the actual dividend payment. The payment schedule for dividends throughout the year is specified in the issue's prospectus. For a preferred stock that pays quarterly dividends there will be four payment dates listed (usually in the prospectus section titled "Dividends"). But if a payment date falls on a weekend, holiday or other non-business day the closest business day after the payment date is the date that shareholders will receive the actual dividend payment. The date of actual payment is called the distribution date. And, for fixed-rate preferred stocks, the amount of that dividend distribution will be exactly the same every quarter, regardless of your original purchase price and regardless of the then-current market price. The dividend amount is calculated by multiplying the declared dividend rate (coupon rate) by the "liquidation price" which is usually $25.00 per share (for preferred stocks intended for individual investors). For example, a preferred stock with an 8% declared dividend rate generates $2.00 per year in dividend income to the shareholder (8% x $25.00 = $2.00) per share. Dividing this annual amount by four gives you the quarterly dividend amount that will appear in your brokerage cash account on the distribution date, in this case $0.50 per share ($2.00 divided by 4 = $0.50). This $25.00 value is referred to in the prospectus of a preferred stock as the "liquidation preference," an overly-confusing term that refers to what shareholders will ultimately receive in the event that the shares are liquidated (turned into cash) by the issuing company. The issuing company can liquidate (buy back from you) your shares in two ways: (1) by retiring ("calling") the shares on or after the published call date (which usually occurs five years after the date that the preferred stock is first issued to the marketplace) or (2) allowing the security to reach its maturity date without having previously being called. In either event, the issuing company will liquidate your shares for a price equal to the liquidation preference amount as published in the prospectus. In the meantime, each quarterly dividend will be calculated using the liquidation preference amount and paid to you on each distribution date as published in the preferred stock's prospectus. Pete Townshend, lead singer for the rock group The Who once sang "meet the new boss / same as the old boss." On November 2, 2010 the Federal Reserve announced that they were going to try stimulating the economy by repeating an earlier "Quantitative Easing" program. The original QE1 program was ineffective so it is not entirely clear how doing a bigger version, called QE2, was going to produce a different result. Under QE2, the Fed is purchasing $600 billion of treasury bonds from its member banks, 86% of which have maturities between 2.5 and 10 years. This maturity is meaningful to preferred stock investors since most preferred stocks have a five year lifespan, IPO date to call date. Events that affect the yield of treasuries of this duration usually affect high quality preferred stocks in similar fashion. The idea behind QE2 is that the Fed's purchases would create a shortage of these fixed-income securities in the marketplace forcing investors who invest in such things to pay more. This resulting price increase would drive down the yield of securities with similar durations lowering the cost of capital for businesses (who would in turn increase hiring) and further motivate investors to invest in U.S. businesses. For preferred stock investors, investors jumping from yield-challenged treasuries to other fixed-income securities would mean an increase in market prices as well. Some claim that stock market increases that we have seen since November, pushed higher by investors anticipating increased earnings due to lower capital costs, are a direct result of this Fed program. The initial effect of the QE2 program on treasury yields were reported on the Preferred Stock Investing Reader's Forum (my blog) in a December 29, 2010 post titled "Preferred Stock Investors Ignore Fed's QE2." This chart is an update to the one presented in that December post. Looking at this chart, it is not clear where the hoped-for yield decrease is going to come from. In fact, QE2 thus far appears to be having the exact opposite effect as intended. As the Fed has reduced the supply of these securities, yields have steadily increased, not decreased. The Fed's program runs until this coming August so it has a bit of running room left. But so far, it would appear that QE2 has yet to produce the intended result. 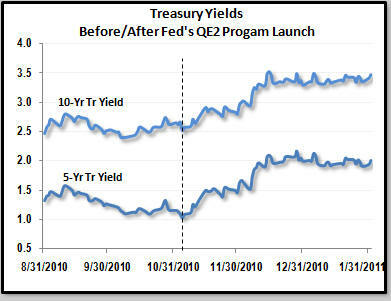 When confronted with these results during an interview a couple of weeks ago a Fed official claimed that the program was, in fact, successful since without QE2 it is likely that these yields would have gone even higher than seen in this chart. Maybe. Because of its size, the effect of the QE2 program on the marketplace for fixed-income securities is worth keeping an eye on but, so far, the program appears to have had little, if any, affect on preferred stock investors. Meet the new quantitative easing program, same as the old quantitative easing program.